The U.S. dollar weakened against the euro last week as its safe-haven appeal faded with the hope of a possible Sino-US deal by the end of this month, when President Donald Trump and the Chinese President Xi Jinping are scheduled to meet and discuss the end of the ongoing trade dispute. The British pound strengthened on hopes and speculation that a final deal with the EU may to be reached soon. At a policy meeting last week, Bank of England Governor Mark Carney signaled rate hikes on the horizon, upon condition of an orderly Brexit. The Japanese yen weakened as the Bank of Japan met and announced that it will continue with its loose monetary policy. 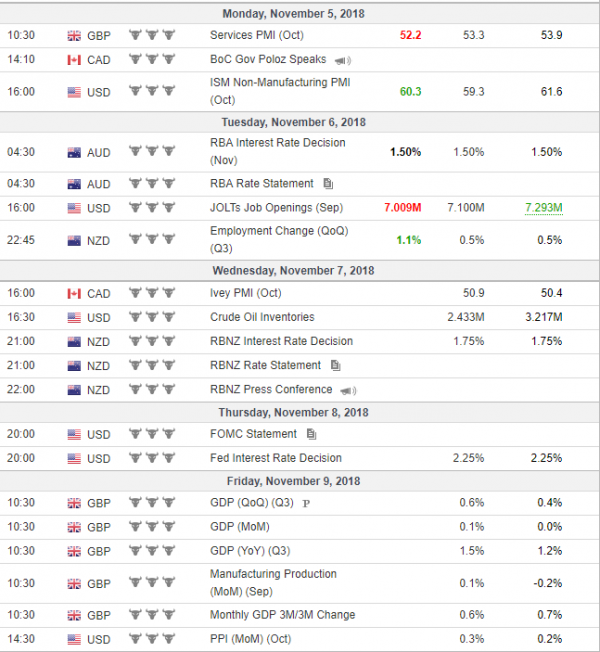 Overall, the US dollar weakened in spite of better than expected data from the US labor market last Wednesday which also saw unemployment remain at the lowest rate for 49 years. U.S. stocks turned lower last week as quarterly earnings results of several companies were mixed and as fears of decelerating global growth reinforced negative sentiment on Wall Street. The Turkish lira continued its recovery and practically erased all losses posted since the beginning of August. Improved relations between Ankara and Washington have underpinned the Lira’s rise. Gold prices were little changed last week, but ended slightly higher due to a weaker dollar and increased risk off sentiment. Oil prices continued to edge down last week on the news that the Trump administration would impose gradual sanctions on Iran to prevent spikes in oil prices. The US granted temporary oil import waivers for 180 days to eight countries – China, India, South Korea, Italy, Greece, Japan, Taiwan and Turkey.